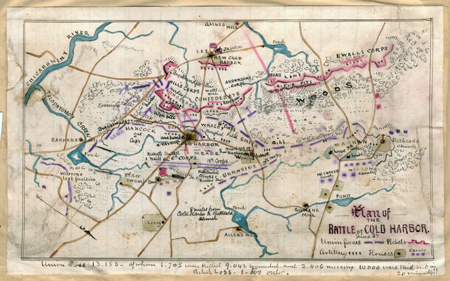 Today in History–June 3–the Library of Congress features the second Battle of Cold Harbor, begun on this day in 1864. The bloody battle ensued when Union General Ulysses S. Grant encountered Confederate troops in Virginia as he made his way to Richmond. Approximately 7,000 Union troops perished and Confederate forces suffered around 1,500 casualties in the nine-day fight. Find out more by visiting the Today in History section, then click the links below to access primary sources related to both battles of Cold Harbor.